Apple has revealed an updated design for the controversial store it plans to build in Melbourne's federation square. The iPhone maker formally submitted its plans to the Victorian government today, which would see Apple construct a global flagship concept store in one of Melbourne's most popular tourist spots. The plan was originally revealed in December last year, and was soon met with backlash from the community and politicians alike. The building was criticised for its 'pagoda-like' façade which Victorian Greens MP Ellen Sandell labelled "out-of-context" and "poorly integrated" with the existing Federation Square architecture. The Victorian Greens party also protested that the decision to build an Apple store was instituted without public consultation. In February, Sandell introduced a disallowance to revoke Apple's planning approval following a petition to constituents. 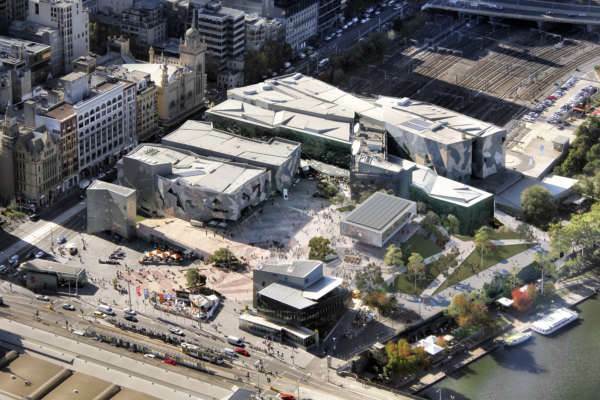 The new design was developed over a series of workshops involving Federation Square management, the Victorian government, Melbourne City Council and Apple itself. Federation Square's management expects the Apple flagship store to attract an additional two million people to the square each year. It was designed with a flat roof, unlike the original design, that allows for solar power and solar shading. In addition, the square's management said the new store would create more than 500 square metres of new public space, provide outdoor shading and better connect Federation Square to the adjacent Yarra River. Apple said it will run a daily program of free events out of the new building that will showcase local technology, design, art and education communities. The Victorian government said the new store would create more than 250 construction jobs and support more than 200 ongoing jobs in the precinct. The redesigned store plan still requires approval from the Victorian minister for planning, who will consult with Melbourne City Council and the office of the Victorian Government Architect before giving his final endorsement. The store is expected to open in late 2020.